A young boy suffering from malnutrition is held by his mother at a UNICEF-supported Outpatient Therapeutic Program (OTP) in Baidoa, Somalia. Building resilience for the world's most vulnerable people by reducing poverty, promoting shared prosperity, enhancing food security, and sustaining peace in crisis-affected situations will be the focus of a new partnership framework agreed by the United Nations and World Bank. According to a joint statement, the framework, signed by UN Secretary-General António Guterres and World Bank Group President Jim Yong Kim, is in response to global calls for the two institutions to work more closely together on prevention and reducing needs, risks, and vulnerability as the world faces a spike in violent conflict. The Secretary-General has been at World Bank headquarters in Washington, D.C., for the past two days for the Spring Meetings convened annually by the Bank and the International Monetary Fund (IMF). They bring together central bankers, ministers of finance and development, private sector executives, and academics to discuss issues of global concern, such as the world economic outlook, poverty eradication, economic development, and aid effectiveness. 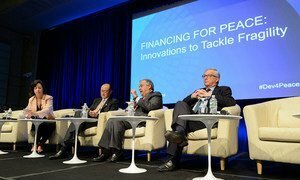 The UN and World Bank noted that human and economic costs of conflict are massive, affecting long-term stability and prospects for economic development and poverty reduction. Violent conflict drives 80 per cent of humanitarian needs costs, with the UN estimating that $22.1 billion is required in 2017 for humanitarian assistance – a sharp increase from the $9 billion needed just five years ago. Under the framework agreed today, the UN and World Bank will work in complementary ways to: reduce the multi-dimensional risks of crisis and help prevent violent conflict; develop joint analyses and tools for more effective solutions; coordinate support to address protracted crises including forced displacement; and scale up impact by leveraging financing. The framework also notes the importance of aligning and leveraging financial resources, doing more through innovative, data-driven operational responses. To advance this work, the two institutions will focus on building resilience in, among others: situations where there is a risk of violent conflict or ongoing conflict; situations with high levels of forced displacement; protracted and post-crisis situations; and when climate change and natural disasters affect these situations. Scale up impact, by leveraging existing financing and comparative advantages, and ensuring that operational policies, frameworks, and tools used by both organizations facilitate cooperation and improve efficiency and complementarity. ♦ Receive daily updates directly in your inbox - Subscribe here to a topic. ♦ Download the UN News app for your iOS or Android devices. Noting that a key trigger common to nearly all conflicts is the element of fragility – fragility of States, of institutions, or of societies – United Nations Secretary-General António Guterres has called for increasing investments in preventative measures that address the problem of fragility before it turns into conflict.